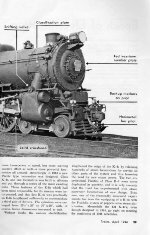 Notes: PRR Class K-4S; Builder's Photo. Description: Here is page eight of a 30-page booklet published by the Pennsylvania Railroad entitled "Modern Locomotives and Cars 1939." 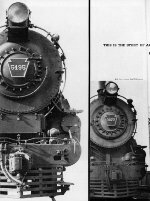 Top Photo: Shown here is PRR engine #5495, a K-4S (4-6-2) "Pacific" built in Juniata during 1928 and retired in April of 1956. Bottom Photo: Shown here is PRR engine #3768, a K-4S (4-6-2) "Pacific" built in Juniata during 1920 and retired in October of 1953. Description: Here is page seven of a 34-page article (in five installments) entitled "Locomotives Of the Pennsylvania." It was published originally in the July 1941 issue of "Railroad" magazine, page 56. Top Photo: Shown here is PRR engine #5495, a K-4S (4-6-2) "Pacific" built in Juniata during 1928 and retired in April of 1956. Bottom Photo: Shown here is PRR engine #952, an L-1S (2-8-2) "Mikado" built in Juniata during 1918 and retired in June of 1957. 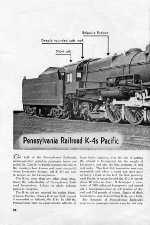 Description: Here is page one of a two-page camera study entitled "Pennsylvania Railroad K-4s Pacific." It was published originally in the April 1946 issue of "Trains" magazine, page 38. No author is specified. Shown here is engine #5495, a K-4S (4-6-2) "Pacific" built in Juniata during 1928 and retired in April of 1956. 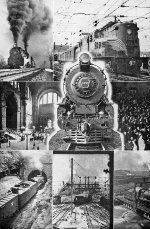 Description: Here is page two of a two-page camera study entitled "Pennsylvania Railroad K-4s Pacific." It was published originally in the April 1946 issue of "Trains" magazine, page 39. No author is specified. Shown here is engine #5495, a K-4S (4-6-2) "Pacific" built in Juniata during 1928 and retired in April of 1956. Description: Here is the front cover of a 15-page cover article by Frederick Westing entitled "This Is The Story Of A Pacific ~ The World's Greatest." 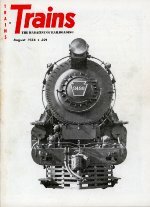 It was published originally on the August 1956 issue of "Trains" magazine. Cover Caption: "K-4s. Courtesy of Pennsylvania Railroad." Shown here is PRR engine #5495, a K-4S (4-6-2) "Pacific" built in Juniata during January of 1928 and retired in April of 1956 after 28 years of faithful service. Description: Here is page one of a 15-page cover article by Frederick Westing entitled "This Is The Story Of A Pacific ~ The World's Greatest." It was published originally in the August 1956 issue of "Trains" magazine, page 44. Both of the locomotives pictured here are PRR Class K-4S (4-6-2) "Pacifics" that were built in Juniata. On The Left: #5495 was built during 1928 and retired in April of 1956. On The Right: #3877 was built during 1923 and retired in April of 1956. Description: Here is page two of a 15-page cover article by Frederick Westing entitled "This Is The Story Of A Pacific ~ The World's Greatest." It was published originally in the August 1956 issue of "Trains" magazine, page 45. All of the locomotives pictured here are PRR Class K-4S (4-6-2) "Pacifics" that were built in Juniata. On The Left: #3731 was built in 1920 and retired in August of 1952. Second From Left: #3681 was built in 1918 and retired in October of 1950. Third & Fourth From Left: Both are of #5495, which was built in 1928 and retired in April of 1956. Incidentally, the builder's plate depicted at the top of the page belongs to engine #5495. 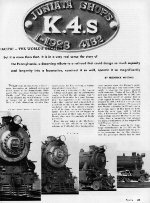 Description: Here is a builder's photo of Pennsylvania Railroad engine #5495, a K-4S (4-6-2) "Pacific" built in the Juniata Shops during 1928 for passenger service. It was retired during April of 1956.